You know, everybody makes resolutions in January and by the end of the month, they’ve given up on at least half their goals. But who says you have to wait until the next January to try again? It’s a new year, a new month, a new beginning. Every day is a chance to start over, start new, make a different choice. The Sea of Tranquility is beautiful a reminder that every person in your life is there for a specific reason and that reason is not always obvious. Some people are there to be your friend when you need one the most, some are there to help you through the hard times, some to make you laugh. Some people are there to teach you an important lesson or to learn one with you. Some are there by choice and others by necessity. Most never know how they’ve influenced you. Some are with you all your life and some leave when their purpose has been served. But they all have a purpose in your life and each one is important. And sometimes you get a second chance with somebody important to you. I believe everyone who reads this book will find something different, something that matters in their life at that particular moment. 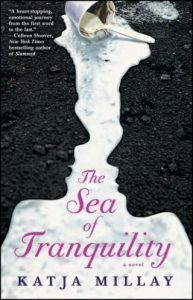 I read The Sea of Tranquility at just the right moment for me and found a beautiful story of love, loss, redemption and the extraordinary power of human relationships.